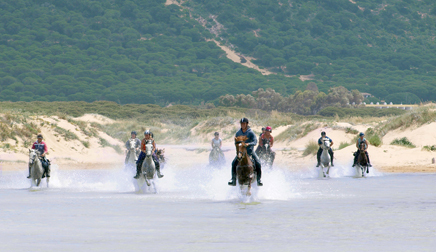 This ultimate Spanish riding experience with Spain's Coast Train & Trails! This riding program was formed in 2001 by husband and wife, Andrew and Rhiannon Williams and Andrew’s sister Rachel Williams. Rhiannon and Rachel have been riding since they were small children and together they formed a plan to bring their passion for horses and for Spain. Together the team brings together all the skills needed to create one of the finest vacation riding establishments in Europe. Spain Coast Train & Trails is situated near the small hamlet of San Ambrosio, 5 km or 3 miles from Los Caños de Meca, a small costal village on the Costa de la Luz in Andalucia Southern Spain between Barbate and Conil. Each day of riding begins around mid morning. The horses are all tacked up for the rides before they arrive. Monday, Tuesday and Wednesday rides are a mixture of forest, beach, and countryside trails. The ride will stop at various different local tavernas for lunch before riding on in the afternoon. There will be plenty of long canters and exhilarating fast gallops. Thursday is a day off from riding, with a visit to the city of Jerez to visit the horses at the Royal Equestrian School. This is a full day, starting with breakfast in Jerez, a visit to the stables, the carriage museum, the show, lunch and the chance to go Sherry tasting. Jerez is the home of the fortified wine, Sherry. Friday's ride is back to the beach and Saturday takes you out along the cliffs following an old Roman road with spectacular views of the African coast. One evening, guests will have a chance to visit the historic local town of Vejer de la Frontera. Friday night includes an evening out to a local taverna to hear Flamenco singing and watch the dancing. Surrounded by miles of national forest, there are lovely walks or guests can go running if they are very sporty. There are 3 local bars within walking distance, but no shops. If travelers have a car there are many lovely local towns and fantastic beaches. There are water sports available in the area and also many excellent golf courses. Mountain bikes are available on request. For those of you who have already tried horseback riding on the beach -- need say no more. The rest of you should prepare to make your dreams come true. Ride along the edge of the forest down onto the long sandy beaches of Cape Trafalgar and El Palmar. These beaches stretch for 10Km or 6 miles, giving plenty of room to let your horse show you what he can really do. The pace on the beach is fast and exhilarating and something you will never forget. People and horses leave the beach with big grins and lots of sand on their faces. The rolling hills of El Campo offer fantastic views over the forest and on toward the mountains of Morocco in the distance. You make your way along ancient drover’s roads and cattle tracks that have been used since the first farmers settled the area. Ride past the historic Ermita de San Ambrosio, dating from the Visigoth era and down through the sleepy Andalucian hamlet of San Ambrosia, which still remains a village steeped in traditional rural Spanish traditions. The Barbate Nature Park is Andalucia's second largest coastal reserve. The spectacular cliffs are full of nooks, which provide a safe home for birds, including egrets, kestrels and one pair of peregrine falcons who have decided to nest here. The nearby port of Barbate is the center of the region's tuna fishing and canning industry, profiting from the (so far) plentiful blue fin tuna to be caught off the coast. Thick stands of stone pine provide shade for a stunning variety of Mediterranean wildflowers. Ancient watchtowers stands on the cliffs overlooking the sea, where local fishermen use the traditional almadraba technique to catch tuna fish, laying walls of netting to force the huge animals into their trap. Because of its location, this area has been occupied by ancient civilizations: Phoenicians, Carthaginians, Romans, Moors and Christians. You can still see old Roman ruins while their ancient roads still stretch out along the cliffs. This natural park is characterized by beautiful woods of umbrella pines with rosemary, blackthorn and palms. Two impressive cliffs, Torre del Tajo and Los Caños de Meca, fall over a hundred meters into the Atlantic. This is a protected area due to the ecosystems of the rocks and the rich offshore marine life. It is considered one of the most diverse and best-preserved parts of the Andalucian coast. The local town of Vejer is a beautiful whitewashed village perched high on a hill overlooking the banks of the Barbate River and with spectacular views of North Africa just 9 miles (15 kilometers) away. Steeped in Arab traditions, it is one of the original famous “White Towns” of Andalucia. Enjoy a leisurely walk around the still intact city walls, and through the streets where a mixture of Moorish, Roman, and medieval architecture stand side by side. The forest consists of 5000 hectares of mainly umbrella pine and eucalyptus trees, giving a unique fresh aroma. The forest stretches out along the hills and cliffs, offering stunning views over the African coast and the beaches of cape Trafalgar. The riding in the forest is excellent, with long sandy tracks and firebreaks that weave their way through the trees and wild flowers such as lavender and rosemary. Here you have the opportunity for long collected canters. As you become more confident with your horse, start to include corners, appropriately call the "wiggly canters". The firebreaks give the perfect opportunity for exhilarating gallops that are loved equally by horse and rider. In between the excitement, travel at a leisurely pace enabling you to take in the peaceful tranquility of the forest while bonding with your horse. Riding is informal, so just be comfortable. You know what feels fine when you ride. A suitable hard hat or helmet along with a good pair of comfortable riding boots are important, but remember this is southern Spain and for most of the year it is sunny and warm. Therefore T-shirts and jodhpurs (or breeches) will probably be your standard dress, along with sunscreen and sunglasses. Your packing list and what to bring will ultimately depend on the season. Some suggestions are listed below. Please visit Equitreking Travel's packing list for other suggestions. Southern Spain rarely becomes very cold, with average winter day time temperatures of 60°F (15°C). Winter will have colder evenings therefore warm clothes should be brought. Warm days and evenings (hot in July and August). Lots of lightweight clothes and swimming gear of course. Outside of July and August, its best to pack lightweight wet-weather gear, just in case. A lightweight riding hat - a proper riding helmet must be worn at all times. Please bring your own. If you want to ride without a recognised safety riding helmet, a disclaimer will have to be signed. The horses are mainly purebred Andalusian or Andalusian crosses. The Andalusian breed, in general, is fiery, spirited and full of life while remaining sound. The Andalusian is one of the oldest Warmblood breeds and they are used in all disciplines, especially those requiring high energy, soundness, and dependability such as jumping, dressage, stunting, and eventing. Andalucia is horse country so even the cow-ponies here are well schooled. All of the horses have been trained and are incredibly responsive. At any given time, ther are around 22 horses in work at the facility, all with different personalities and abilities. The riding style is English, with several different types of English saddles available including endurance style saddles. In addition, there are Spanish saddles for those who wish to try them, or for riders more accustomed to Western style riding (the Western saddle is a derivative of the Spanish saddle and rides very similar). The horses are kept in several large paddocks under the pine forest near the finca. The horses are given attentive care and are loved daily and are rotated in work regularly to prevent overtiring. The horses are very eager and willing to work and are regularly taken out with the larger group, in small groups and on their own to help ensure their adaptability to any situation. You will find that these horses are not your typical “trail ride” horses. Having much more independence, they will allow you to be a part of a riding experience unparalleled. There are a number of special events during the year that are a “must see”. International Show jumping and dressage usually the end of February through March at Montenmedio just 15 minutes from Spain Coast Train & Trails headquarters. The week before Easter, all of Spain celebrates “Holy Week” with amazing processions around their towns and villages. The sound of the bands and the sight of hundreds of local people carrying huge platforms holding statues of the Saints is something very special. Guests are taken to have dinner locally before watching the procession which starts at 10pm. The Seville Fair takes place just two weeks after Semana Santa, in a huge area in Los Remedios, to the south-west of the city, next to the river. This is a week of serious dancing, drinking, eating and socializing, with late nights - or all-nighters - the norm. The sheer size of the April Fair's spectacle is extraordinary. From around midday until early evening - Sevilla society parades around the fairground in carriages or on horseback. As part of your riding holiday, visit the world famous Feria del Caballo that is held in the stunning city of Sevilla. You will have chance to explore the historic city centre including the cathedral and the amazing Moorish palace, before a leisurely lunch in one of the lovely picturesque plazas. Then on to the feria to sample the sights and sounds and to take in a carriage ride around the decorated streets of the fair ground. The Jerez Horse Fair (Feria de Caballo) is an exciting and lively event that every year brings the entire city to the Gonzalo Hontoria Fairground, which covers 52,000 square meters, giving ample space for the finest horses of Jerez as synonymous with the city as sherry and flamenco, to show off their moves to the crowds who flock to the casetas. It is known for its refined air, due to the many aristocratic sherry families in the city with their beautiful horses and stunning carriages. Guests get to spend the day at the fair, starting with a visit to the indoor trade show and shops, and arenas where various displays can be enjoyed. Then have a leisurely lunch in a typical caseta over looking the main drag that is filled with carriages and horses. All around are the sounds of flamenco singers and dancers enjoying the sherry and the shear pleasure of the day. After lunch, guests can enjoy a carriage ride around the extensive fair ground before returning to the facility for dinner-- truly a fantastic day out! The Royal Andalusian School of Equestrian Art (in Spanish, Real Escuela Andaluza del Arte Ecuestre) is an institution in Jerez de la Frontera, Spain, devoted to conserving the ancestral abilities of the Andalusian horse, maintaining the classical traditions of Spanish baroque horsemanship, preparing horses and riders for international dressage competitions, and providing education in all aspects of horsemanship, coach driving, blacksmithing, the care and breeding of horses, saddlery, and the manufacture and care of horse harness. The Royal Andalusian School is a riding school comparable to the Spanish Riding School in Vienna, Austria. Like the Spanish Riding School, the Royal Andalusian School is well known for its "dancing stallions" shows for the tourists. The school is adjacent to the historic nineteenth-century Palacio de las Cadenas in Jerez. Accommodation is in the Hacienda Jacaranda. The bedrooms have twin or double beds and a small en-suite shower. Single rooms are subject to availability at no extra cost. The rooms are set in spacious private gardens of palm, cactus and fruit trees where there is plenty of space to relax with a good book. There is a large swimming pool (not heated). The spacious dining area and comfortable lounge has an open fire, television, DVD and music system. This riding holiday is all inclusive and includes breakfast, lunch, dinner, and snacks. Breakfast is a buffet with cereals, toast, ham, cheese, yogurt and eggs. Lunch is at different local tavernas around the area. Food is always very fresh with lots of local dishes of various fish, seafood, meats, salads, tortilla’s, and more. Evening dinners are 3 courses. Once again, lots of locally produced foods with a mixture of traditional Spanish dishes and old favorites such as lasagna (for example). Most diets can be catered to and vegetarians are not a problem and as long as mentioned at the time of booking. There are always snacks available from potato chips to chocolate to nuts. All drinks including alcoholic drinks are included. There is no limit. This riding vacation is for the intermediate to advanced rider who is comfortable at the walk, trot, canter. Riders must be comfortable controlling their horse in open spaces, like beautiful Southern Spain beaches. No beginners or novice riders please. Non-riders are welcome to join their partners on these horse riding holidays in Spain. There are many local sites and amenities to make for a dream vacation for non-riders as well. Ride Spain's coast through a mixture of forest, beach and countryside trails. Visit the Royal School of Equestrian Art where you will see a display of "Dancing Andalucian Horses", along with Carriage Driving. No charge for single rooms, subject to availability. Seven nights full board accommodation; five days riding; drinks at the villa; visit to the Royal Andalucian School of Equestrian Art in Jerez; shared transfers from Malaga or Gibraltar airports at a set time. Winter short breaks of 4 night (normally arriving Wednesday and departing Sunday) are available between November and March, with the exception of Christmas and New Year weeks. Short Summer Breaks run from late-June until the end of August. International flights to Malaga or Gibraltar. Bar bill; tips; massage treatments. * Prices shown are subject to daily exchange rate fluctuations and are set in the Britsh Pound. Sample 7-night Spain Riding Vacation Itinerary** Below is an example of a typical week’s riding holiday. The itinerary may vary depending on local conditions and the ability of the group, but always with your best interests in mind. The normal pattern (weather permitting) is to set off at about 10am and stop for lunch at a local village bar and then ride on again in the afternoon. However, the introductory ride is usually shorter in duration. In the hot summer months (mainly July and August) you will usually set off at around 9am and the pace of ride will be dependent on the weather, so if it’s very hot then the pace may be a little slower. After your morning ride you will be taken to have a late lunch at a local bar. This is really more of a traditional summer holiday; pool, beach, sun and sea, coupled with a few hours great riding each day. Please note that between mid-June and mid-September we do not ride close to the ocean’s edge due to the number of people on the beach. Instead we ride in the sand dunes in sight of the water. Arrive in time to unpack and freshen up before a light Spanish style late lunch. Later on, meet the horses and have dinner at the villa. After breakfast at the villa, meet at the stables (a short walk away from the villa) and be introduced to your horse, before setting off into the forest for your first ride. Today is a fairly quiet ride giving rider and horse the opportunity to get to know one another. Wind along old drovers’ tracks, through the heart of the National Park. Visit a local bar for lunch, then continue riding, arriving back at Los Alamos mid-afternoon. On arrival you untack and wash off your horse (your guide will be on hand should you require assistance with this). The rest of the afternoon is for you to relax before meeting for dinner at c.8:00pm. This will usually be your first visit to the beach with your horse. Ride through the edge of the forest down on to the beaches of Cape Trafalgar and El Palmar. There will usually be the opportunity to experience some faster riding, but please note that a beach canter is not always possible as it is dependent on the tide conditions. Heading away from the beach, you cross into unspoilt countryside, following drovers’ trails that have been used for hundreds of years. Stop for lunch at a local village bar. Then twist and wind back through the forest, arriving back at the villa by mid afternoon. After the horses have been cared for you have the rest of the day to relax before dinner. Today may give you a chance to really open up with long controlled canters and some faster riding through the forests winding paths and firebreaks. Have lunch out in the forest at an old Spanish taverna serving local cuisine. Arrive back at base and have the rest of the afternoon at leisure. Today the horses have a rest day and you will be driven to Jerez to visit the Royal School of Equestrian Art where you will see a display of "Dancing Andalucian Horses", along with Carriage Driving. Depart from Los Alamos at c. 8:15am and have breakfast at a café in Jerez. During the morning you can visit a nearby tack shop and wander around the School’s carriage museum and stables, before taking your seats for the start of the show at around midday. Afterwards have lunch in a local Tapas bar and sample the famous local sherry. Return to Los Alamos in the afternoon. For those guests who choose not to go to the Royal School of Equestrian Art in Jerez, there may be the opportunity to experience a sherry tour in Jerez or perhaps have a lesson from Antonio Corales (subject to availability), a top Doma Vaquero and Doma Classical teacher, who trained with the Royal School. Please note that these lessons are subject to a riding assessment. Please ask if you would like more details. If you choose simply to relax at the villa, then have a swim in the pool or take a walk in the Natural Park. There will be food in the fridge at the villa from which to make your own lunch. Today's ride takes you back down to the beach. Ride along quiet tracks passing cattle farms and a hermitage first built in 700 A D. On reaching the beach, traverse your way through the sand dunes with views out over the ocean. Stop at a beach bar for lunch. It is a pretty ride back through the umbrella pines, with the sounds of cowbells and the intoxicating scent of French lavender never far away. Once again the rest of the afternoon is for you to siesta or just relax by the pool, before meeting up in the evening for dinner. Your last day’s riding! A slower days riding where you head off into the forest over to the Moorish look-out tower of "El Tajo" which incorporates the fantastic cliff views of Africa. After lunch at a local bar you will then mount your horses once more for a firebreak ride and one last burst of speed at the edge of the forest. After saying a final farewell to your horse you have the afternoon to relax. Meet again at around 8.00pm for a farewell dinner with new found friends. After an early breakfast say your goodbyes and transfer as a group back to the airport to catch your flight home. "My spouse, Robin, and I just got home last night from a mid-winter vacation, and I would like to take this opportunity to give you a quick review. We booked the trip found on Equitrekking Travel (the "Spain Coast Trails" trip), and learned about it originally through Darley's Equitrekking program. In the simplest terms, it was a fabulous vacation. The owners and staff are extremely capable professionals, not only in managing the horsey-end of their business, but also in providing a very comfortable, friendly, family-scale, small-inn experience. We were especially impressed with the sensitivity and expertise used to assess our individual riding abilities and interests and to match us with horses and trails guaranteed to keep grins on our faces the entire week. I was even impressed with the way in which various hospitality and equestrian duties were shared and scheduled among the owning family and staff. We did not get the chance to meet co-owner Rachel because she was away for our week there, but Andrew and Rhiannon Williams came to feel like long-lost old friends very quickly, as did inn staff Jim and Linda and wranglers Abby, Jose, and Jesus. The riding experience is what we went for, all we hoped for, and more than we expected. Properly described as being suitable for intermediate and advanced riders, the rides included a bit of fast work each day, negotiating some good but often steep trails, and riding sensitive, forward, but very well-behaved horses. In general, a visitor should be a good rider, in good condition, with a good seat. He or she should ride regularly several times a week for 5-6 weeks leading up to the visit and should include fast canters and hands-forward, two-point qallops in preparing for this vacation. That said, our rides were truly relaxing as well as invigorating. Mostly we moved at a comfortable walk just soaking in the beauty of La Breña y Marismas National Park and the beaches of Cape Trafalgar. The horses we rode included a number of Andalusians and Razas (P.R.E.) breeds, a couple Andalusian/Arab mixes and a beautiful cob named Polly. Finally, it would be remiss not to praise the comestibles! Any good vacation can rise or fall in the quality of the eats, and we were very well fed. At the inn we were fed healthy, well-balanced, delicious home-cooked meals. During the days we had delicious lunch breaks at a couple of cafes in Barbate. Oh how I wish I lived somewhere I could ride my horse up to lunch at a beach cafe! On Friday evening, Vaquera-in-chief Abby Messer took us all out for a home-cooked paella dinner in the stunning old white hill town of Vejer de la Frontera. After rides and after dinner we and the other guests tended to hang out in the copious and comfortable lounge at the inn. A fireplace, a box of chocolates, and an open self-serve bar and fridge (all beverages came as part of the package) kept us warm well relaxed during our out-of-the-saddle times. Rob and I took this trip as a celebration of our 30th wedding anniversary. We both agree it was one of the very nicest holidays we have experienced in our lives, and we hope we will be able to go back again soon to ride with new old friends on great horses in beautiful country. Thanks, Julie for helping with all the arrangements, and pass our thanks on to Darley for introducing us to this experience. “I have had a brilliant time. I had not ridden for ages and am not very fit at present, so I was bit dubious, worried, about my ability to cope, but the horses were so wonderful, really calm and well behaved, Sevillano looked after me, he is fabulous and the Spanish saddle helped. The riding was stunning, especially the beach gallop, so exhilarating. Everyone was so friendly, thanks for a marvellous week. This is by far the best ever riding holiday I have been on, and I hope to be able to return. Love to all"